Although I am not from VIMS, I have been invited on this cruise by Dr. Tracey Sutton in order to assist him in his research, gain a more “hand-on” experience in deep-sea research, and formulate questions to be answered possibly in my own future research. Today marks two special occasions: our second week at sea, as well as my first birthday at sea. It has been a rather overwhelming journey thus far. All of my reading about deep-sea ecosystem structure and diversity could not even remotely prepare me for what I’m seeing out here in person. I have now officially been farther out to sea then I ever have in my life. I’m definitely not in Georgia anymore. I’ve been working the 12 pm to 12 am shift, and it’s definitely a great shift to be on. The trawls have been coming in pretty regularly, and I can truthfully say that I am ceaselessly surprised by the awesomeness that we are pulling up from the depths beneath us! 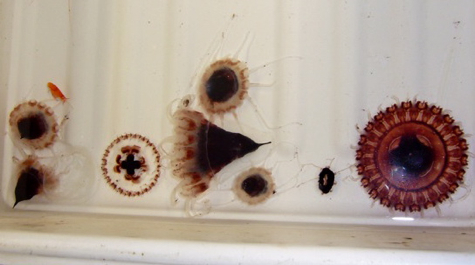 I have been working on identifying jellyfish, and I have seen some really awesome ones, including Atolla wyvellei (red circular), Halicreas minimum (clear with orange segments), and the ever-common Periphylla periphylla (pointy red cap with a skirt medusa). These jellies make up a huge portion of the biomass in the bathypelagic zone. I frequently find myself thinking what it would be like to be a deep-sea creature just as the Norwegian trawl swept through and captured me. I’m sitting there, minding my own business, and then SWOOOOOM out of the dark a large rope swoops me up! See what happens when you are at sea for a few weeks and left to your own thoughts? I find that it’s extremely important to keep an “all-business” attitude in the lab, and I am more than willing to comply. Absolutely no goofing around happens on the job (HA HA). The gear has been pretty consistent with one minor exception being yesterday morning’s trawl. One of the door cables broke, causing our gear to come spiraling up in a tangled mess to the surface. We all huddled in the sorting room as we watched the crew rescue our gear and bring on board what was probably the most diverse trawl of the voyage. I have been forming many questions about the ecology of the systems out here, some of which I may be able to explore in more detail later. This cruise will definitely bring back some really interesting data about the distribution and community structure of deep-sea ecosystems. I am excited and honored to be a part of this amazing research. 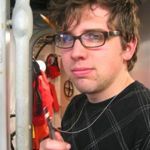 We’re supposed to have a few stormy days ahead before we start bottom trawling, so I hope it won’t set us back too far. We only have a few weeks left and I can’t wait to see what we find next!